The Scottish Fire and Rescue Board has voted to consult on plans to reduce the number of fire control rooms. Members rejected the idea of moving towards just two centres from the current eight - backing the principle of retaining three. Johnstone in Renfrewshire will be retained, along with two others. The plan could mean the closure of control rooms in Inverness, Aberdeen, Thornton in Fife, Maddiston near Falkirk, and Dumfries. The Scottish government said before the meeting that the details of the plan were a "matter for the board". The strategy put to the board also included a single national training centre at Cambuslang, and the identification of a national headquarters building "located in the area bounded by Perth, Glasgow and Edinburgh". The fire service would dispose of the Scottish Fire Service College at Gullane in East Lothian, and property at Maddiston and Thornton. 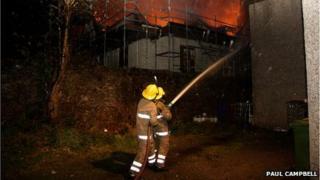 Property would also be released at Cowcaddens in Glasgow and North Anderson Drive in Aberdeen, although fire stations would be retained at both sites. Also surplus to requirements would be Lauriston Place in Edinburgh, although "steps will be taken to ensure continued public access to heritage assets in Edinburgh". The paper presented to the fire board estimated that not pursuing a programme of property rationalisation and investment would involve continuing costs of £4.7m per year, equivalent to 162 firefighter posts. It said that "dialogue will be maintained at all levels with the Scottish government" to ensure that permission is granted for money raised by disposal of surplus properties to be re-invested. The paper stated: "It is recognised that property rationalisation will have a significant impact on employees and throughout the process detailed analysis has been undertaken to understand the nature and extent of this." In advance of the board meeting, the Scottish government confirmed it had been informed of the strategy. A spokeswoman said: "We are aware of proposals to be discussed by the Scottish Fire and Rescue Board. However the detail of these is an operational matter for the board. "The board is committed to the Scottish government's policy of no compulsory redundancies." Fire Brigades Union's Scottish chairman Alan Paterson said: "We will start to consult with our members on the detail once we have time to digest it and then both sides can get back into some meaningful discussions and negotiations with service managers. "On any proposals, when it comes to the details, it's very difficult to measure of what degree the risk is." Following the board meeting, Chief Officer Alasdair Hay said: "This is not something that will be achieved overnight. "It will take a number of years and requires a detailed implementation plan. "What I can say is that we are committed to ensuring community safety and firefighter safety and that any changes we make will not compromise those two critical tenets of our organisation." Fire board chairman Pat Watters added: "I recognise that the plans discussed today will affect a number of our staff and naturally everyone is concerned when there is change. "It is important to stress these changes will take a number of years and we will be working closely with staff and representative bodies as we develop implementation plans." "I'm concerned that these decisions have been rushed through and there hasn't been any thought on what happens in the local communities where the call centres were. "I would also like reassurance that the closure of these offices doesn't lead to any dip in service." Scottish Liberal Democrat justice spokeswoman Alison McInnes has criticised the proposals. She said: "Increasing the number of planned centres from two to three is simply not good enough. This will result in a significant loss of local knowledge, which we know is crucial to our emergency services. "You can't put a price on life and it is a false and crass choice to say we can either have more control centres or more firefighters."